Most of you know my pledge awhile back to cook more with whole grains and beans and less with milled and processed carbohydrates. I'm going to do a series of posts showing my experiences and giving a few recipes. Remember, whole grains and beans retain all of their nutrition when in a dormant seed state. The clock starts ticking when grains are milled or come into contact with moisture. I thought I would start with a big one - wheat berries. Wheat is probably one of the most consumed grains out there with the popularity of whole wheat bread as a nutrition staple. Few realize though that wheat berries can be purchased and made into a variety of tasty dishes. Wheat has been cultivated worldwide for centuries. It is believed that it was first cultivated in Western Asia, but has been found in early artifacts from China, Egypt, and Rome. Egypt provided the wheat for most of the Roman Empire which eventually led to the spread of wheat to Europe, Great Britain and the Orient. When ships from Spain came to the New World in the 16th century, seeds of wheat were on them, and thus began it's cultivation in North and South America. A good quality wheat is remarkably well-balanced. It can be nearly one-fourth protein and rich in many other nutrients. These include Vitamin E and B vitamins. This is important for those who are cutting back or eliminating altogether their meat consumption. 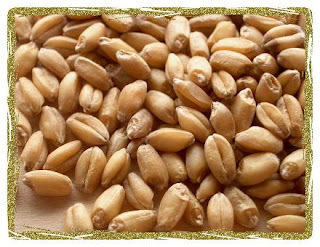 There are two main types of wheat berries available and it's important to know what they are used for. Hard Red which is high in protein and used for bread making. Soft white which is higher in starch and used for pastries, cakes and such. Here are a couple of recipes to try. Soak wheat berries in water the night before. Drain. Add 2 cups of water and salt and bring to a boil. Simmer for about 2 hours until wheat berries are tender. Alternately you can soak the berries for 8-10 hours. Drain. Put wheat berries in a 1 quart thermos. Boil 2 cups of water and add to the thermos. Cap and lay thermos on it's side. Leave overnight. Serve wheat berries like porridge, with milk, maple syrup, or honey. Add salt or pepper to taste - or not at all. This salad has tons of flavor. In a large bowl, toss together the wheat berries, tomatoes, and onion. Put the basil, oils, vinegar, garlic, salt, and pepper into a blender container. Cover and blend until smooth. Pour dressing over salad and toss. I get my wheat berries (and many other whole grains) from Hampshire Farms here in Michigan. They sell beautiful, organic, grains at a great price. Google to find a place near you! Or scope out your local farmer's markets to find a source. For more reading on whole grains check out this post. Do you buy the wheat berries in bulk from Hampshire? In what quantity and price? I'm in Michigan too and was looking for a supplier. Thanks. Hampshire Farms sells the grains and beans at the Royal Oak Farmer's Market in 2 pound bags. You can order in bulk - 25 pounds for a better price. To see the prices for the 2 pound bags check this website http://www.hampshirefarmsorganic.com/beans_seeds_flour.html. To get prices for the 25 pound bags - just email them and they will give you a quote. I am starting to use more whole grains, and I am filled with many questions. They may seem trivial to you at the moment but I am ignorant about whole grains. I am only accustomed to brown rice and quinoa. I went to the store (Wholefoods) and saw wheat berries in the bulk section. They were white in color and took some trial and error until i cooked them correctly. Here are my questions, if you can answer please do and if you cannot just pass over it, or forward me to a good resource you have used. Have you used the red wheat (that you mentioned was used in bread making due to higher protein content) as a main dish staple as rice or pilaf? If have tried it in recipes other than bread, what does it taste like in comparison to the white wheat? What is the difference between soft white, hard white, soft red, hard red? The hard berries are a bit "chewier", but I still like them. That's about the only difference I noted. Check out this page for descriptions of the 6 different types of wheat grown in the US.